Home / Food Making Videos / Chicken Biryani Restaurant Style Making - பிரியாணி செய்யும் முறை !!! Chicken Biryani Restaurant Style Making - பிரியாணி செய்யும் முறை !!! 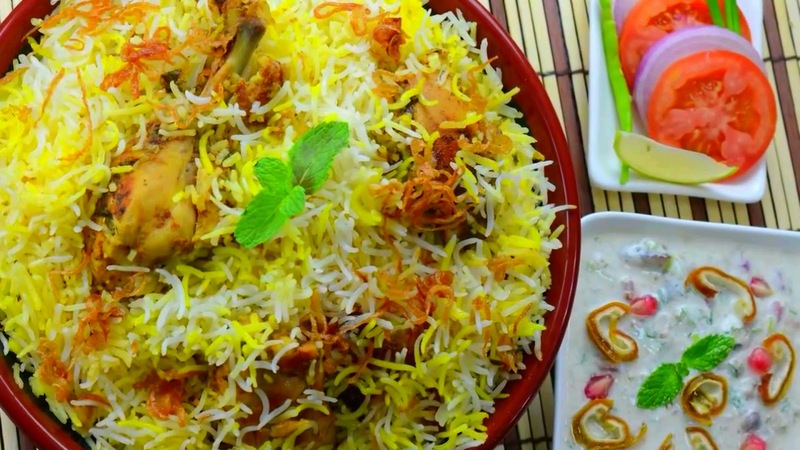 this is kind of restaurant style of preparation of birtani they won't do dum process they cook chicken separately with same masalas which we use for biryani and rice will be cooked separately if the order comes they mex rice and chicken together and serve because the same rice can also used for vegetarians. Heat water in a vessel and let it come to a boil add oil, salt, Shahi jeera, bay leaf and add basmati rice (soak the rice 1 hour) cook the rice till 70 %, add layer of chicken marinate and then this layer of rice. Sprinkle fried onions, and add dissolved saffron strands in milk , then add ghee (optional), kewra water, rose water and put the lid on which is lined with sticky dough for dum.